Designed to endure every day use, our Percy Mission Slat Bed is a hardwood masterpiece.The design is characterized by clean proportions and subtle details. The simple, yet elegant style of the Percy Mission Slat Bed will complement any bedroom setting. Mission beds have long been popular for their plain, straight lines and sturdy construction. Our Amish artisans craft the Percy Mission Slat Bed with the finest quality solid wood using mortise and tenon joinery. All our mission beds are handcrafted by the Amish in the heart of Amish Country. Each mission bed is built out of solid woods and finished with a catalyst finish to ensure beauty and longevity. 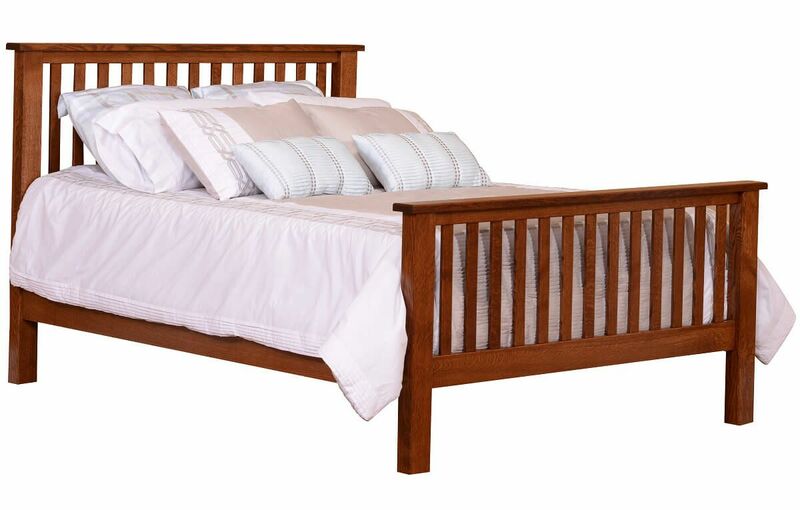 To order the Percy Mission Slat Bed as pictured, select Quartersawn White Oak with a Burnished Honey wood finish.